Did you know that your Google ranking can be strongly affected by external pages that link to you? Did you also know that there are better ways to use links like “click here” to boost your ranking and user experience? We discuss easy ways to get more out of your linking efforts that you can use in addition to our Google Trends article, and really give lasting benefits to your site traffic! Hyperlinks to your website from an external website (i.e. one that isn’t yours) are called backlinks or backwards links. Search engines look for and count the backlinks to your website, Google looks at backlinks as a form of legitimacy and quality. The thought pattern is - if a website has more websites linking to it, it must have something worthwhile that people are looking for. More backlinks generally mean ranking higher in the organic search results for the relevant keywords. However, there is a quality over quantity factor, meaning if more prominent websites link back to yours as opposed to a relatively unknown one, the link from the larger website will carry more weight. Link building is the process used to try and generate more links to your website, which essentially involves contacting other web pages and asking for them to link to you. This can be a laborious task. Social media provides a fantastic opportunity to build links, not by asking people to link to you, but through providing high quality, interesting content that people want to share. This is a much more rewarding way to link build, however we will cover several social media and backlink finding options later. To make quality links, you need to make sure you’re relating to what your user is searching for. Search engines look for the content in a link to help searchers, so the days of relying on “click here” are quickly coming to a close. Below are some examples of bad links that can add unnecessary text to your page, and good links that can help your SEO. Other than that, they will also look a lot better when users scroll through your information looking for pages of interest to go to next! If you are a genuine website producing great relevant content and being consistent with the keywords you are using, you shouldn’t run into many troubles with SEO. Some choose to outsource SEO options, and there are tools and solutions available at rather large prices. Avoid anything that guarantees number 1 ranking or spams you in any way. Also be careful of sites that quote low prices without details on what will be achieved or what personal details they require. As the Google search algorithm is getting more and more complex, it is becoming more and more obvious that web developers just need to follow Google’s code of best practices and create relevant engaging quality content that people want to read and your web page will rank highly. 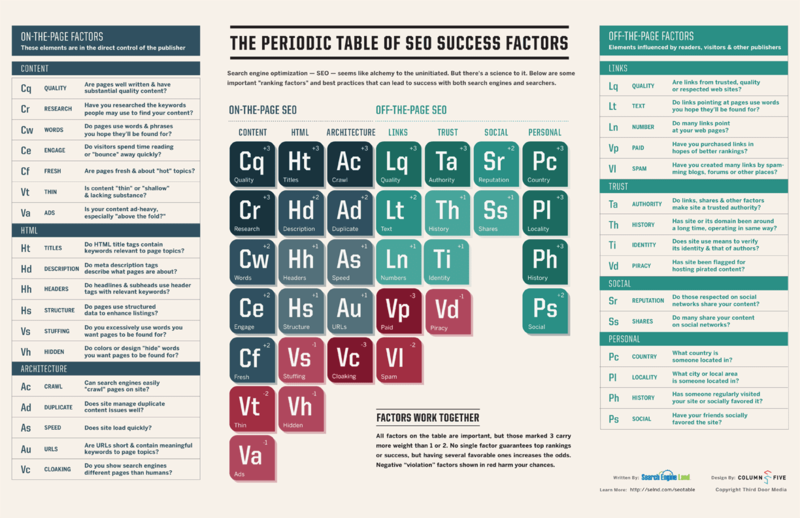 Finally, be sure to save the below Periodic Table of SEO Ranking Factors! This is a Great chart for SEO and sums up all the components rather nicely. Courtesy of Search Engine Land!  I have taken note of any potential blocks in my pages that may be affecting my usability and ranking. Even when contacting for example business or psychologist advice websites, you don’t need to write up a huge business proposal of why they should be linking to your site. They link to businesses their current users may be interested in and you provide this business, simple. Let them know you have looked over their site and like it, then explain briefly what your site is about and why linking to you may be a benefit to their users. You can copy and paste parts of your email content for different users, just be sure that the content applies each time and that you’re saying something of interest to them. We have previously talked about how making titles, tags and key terms relevant to your audience is a huge part of getting more interested people and potential customers to your website. Now we are going go beyond using logical terms and find trending keywords that are actively being searched for by your audience! Google Trends allows you to find out what exact terms people are searching for to put into (and exclude) in your titles, tags, headings and paragraphs! Don’t let the simplicity of this tool fool you, many online investors and writers use Google Trends to find out what people are searching for against timeframes and country to grasp online opportunities as they arise. Let’s get started: Say for example you want to sell rain jackets to Australians. People may search for these by typing ‘raincoat,’ or ‘rain jacket’ and we want to know what words to use to show up more in Google results. 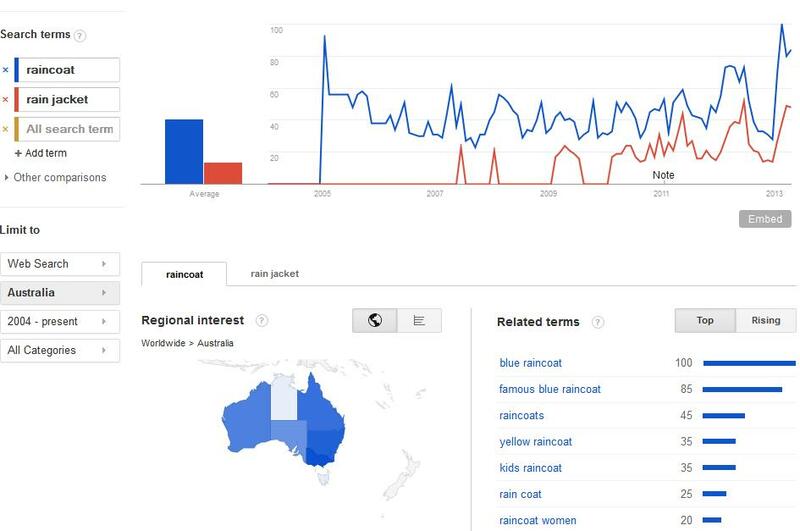 Type ‘raincoat’ in the first ‘+Add term’ box and ‘rain jacket’ in the one below, limit to Australia and see a comparison. We will see which term is more popular, a seasonal trend (literally, as we come toward colder months searches go up) and a higher popularity in Victoria! Does this mean we should completely steer clear of putting “rain jacket” into our headings and text? Absolutely not! People are still searching for it, but we now have perspective about which terms are more relevant to our audience, and what we can expect to see a greater response from. Play around with this tool, get to know the different options. See what happens when you type in terms related to current events or political debates! When you are familiar with this tool you can start putting in terms related to your business and its services, and pay attention to the ‘related terms’ results. Make sure you are searching by the countries the particular webpage’s services can provide for. You will quickly notice that searching for fewer words is more popular than several words at once.  Have you brainstormed keyword ideas with staff members?  Have you run a trend search for important aspects of your homepage and top navigational links?  Have you checked the location and time sensitivity filters for your search?  Are trending words included into URLs, Headings and paragraph text? Before you start brainstorming and searching for trends, it can be a great idea to write up a list of which webpages or services you’d like to get the most attention to. This will most likely be pages that have big important updates or where purchase decisions can be made. After this be sure to optimise pages that people may search more frequently for, this may include informational or advice pages. Need help with SEO keyword selection? We also survey our clients’ website plans and use various SEO tools at our disposal to select and implement the best keyword strategy suited to your goals. Contact info@psychpress.com.au or call 03 9670 0590. Have you ever wondered how Google searches all of the world’s websites and gives us the best results so quickly? This is organised by and intricate system of Spiders and Crawlers, and we’re going to have a look into how your website fits into this system! We’ll also show you quick and easy steps you can do with your URL organising and sitemap to make sure Google is indexing your website! What you see in an Address Bar is called a URL (Universal Resource Locator). It is the address to the webpage you are currently on. This is easy to see. It is ideal to have URLs containing wording that is related to your page rather than a string of numbers or characters. Figure 1 - This is the address to the Psych Press About Us page. This example is for the Psych Press about us page. Notice how the URL has “about us” in it. Your users should be able to quickly recognise what the URL will bring them to as the page loads and when they see it again, if retyping your address. The influence on search rankings isn’t huge, but it is still an influence that is easy to change! Google also reads hyphens as a space but underscores as linking two words together, so keep this in mind. Apart from these considerations, having comprehensible URLs will help greatly with analysis with Google Analytics (which we’ll get into later!). Your website will be crawled by a spider or crawler. These robots index web pages for Google’s search database. If they cannot crawl your website you have a problem. This means your website will not appear as high in Google’s search results. The best way to do this is to create an account with Google Webmaster Tools and check your website’s crawl health. You will need to insert a Meta tag into the HTML of your front page in order for Google to verify that you are the owner. Google will provide the Meta tag for you. Once this is set up you can go to your webpage’s dashboard on Webmaster Tools and see if there are any errors. You should also get accustomed to the ‘Traffic’ and ‘Optimisation’ areas of this tool as this is where you can see which key terms are becoming more effective in attracting clicks to your site! Figure 2 - Webmaster Tools Crawl Errors page. 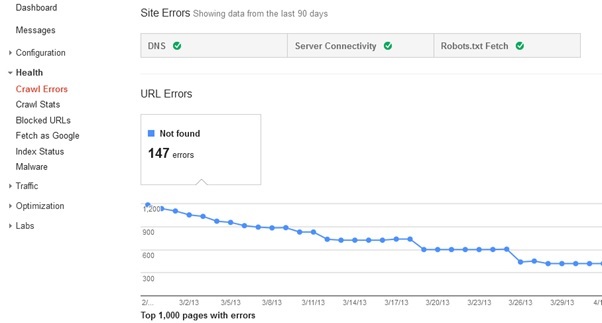 Detailed reports on all the crawl errors are available through webmaster tools. There would not be green ticks if the entire website was unable to be crawled. A quick and easy way to ensure all your pages on your website are seen by the crawlers is to upload a site map and then tell Webmaster tools where to find it on your website. A free site mapping tool can be found at XML-sitemaps.com which is quick and simple to use and will give you the site map file you need. Find it here at http://www.xml-sitemaps.com/. It has a max of 500 pages, which is more than enough for most websites. Once the map is complete upload it to your website and connect it to webmaster tools. The site map will assist crawlers in finding all the pages on your website and improve site visibility to searchers interested in your services!  Are your website’s URLs logical and user friendly?  Is your website connected to a webmaster tools account?  What is the health of your webpage?  Does your webpage have a site map registered with Webmaster Tools? 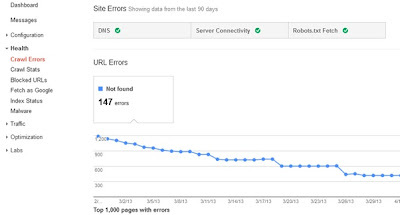 In Webmaster Tools, don’t become too concerned with common errors such as the “404 not found” error if you’re often removing parts of the site. If you follow the error links given and realize it is no longer required or linked to on site it shouldn’t affect your SEO. Another good use of Webmaster Tools for you will be to check how often your page is being crawled, which will usually be around once a week, and backlinks tend to take longer to show up. If you’re making changes and want to check on backlinks or errors the crawl times will give you an idea of when you can expect results. Just keep in mind that all Google ‘tools and rules’ are being further developed all the time!